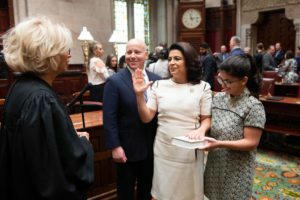 Senator Anna Kaplan is sworn in by Chief Justice Janet DiFiore of the NYS Court of Appeals in the Senate Chamber. 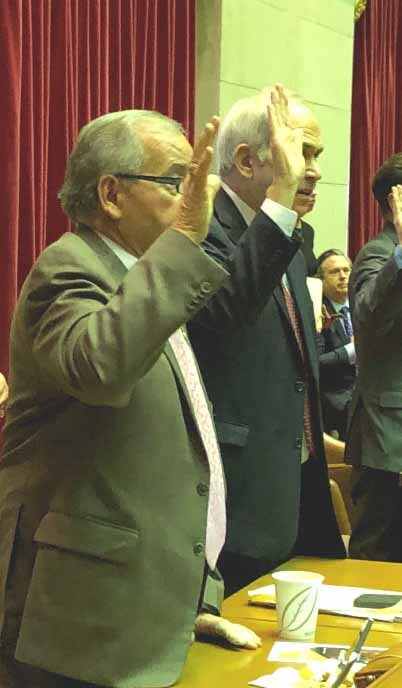 It’s been a busy couple of weeks as many elected officials have been taking the oath of office and beginning or continuing in their positions to serve the community. 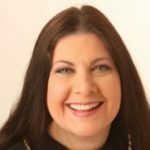 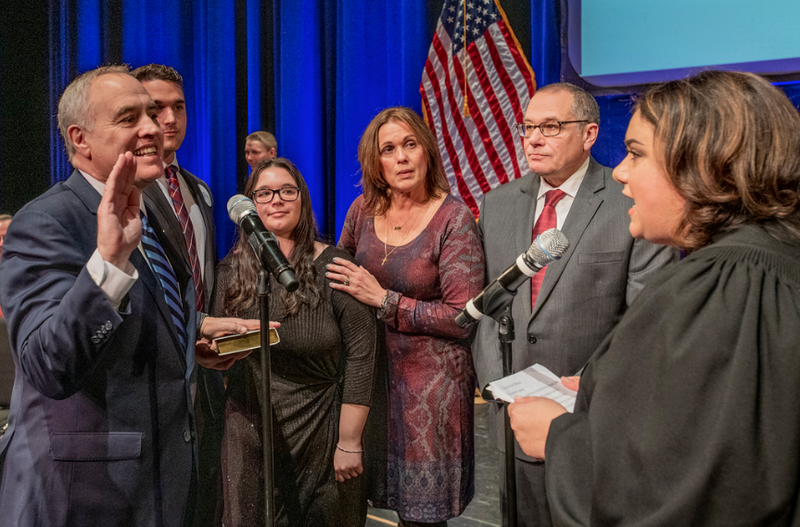 After the picture of Senator Anna Kaplan’s Long Island swearing-in ceremony appeared on the cover of the Jan. 9 issue, a reader pointed out that she should have had her left hand on the Bible and raised her right hand. 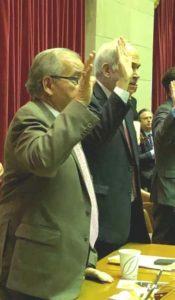 Apparently, everyone was so caught up in the energy of the moment that an oversight was made at the ceremonial in-district oath. 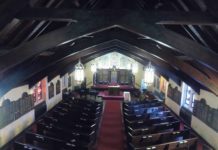 Her right hand was proudly raised in the Senate Chamber when Kaplan was sworn in by Chief Justice Janet DiFiore of the New York State Court of Appeals. Thomas P. DiNapoli is sworn in as NYS comptroller at Hofstra University on Sunday, Jan. 13. 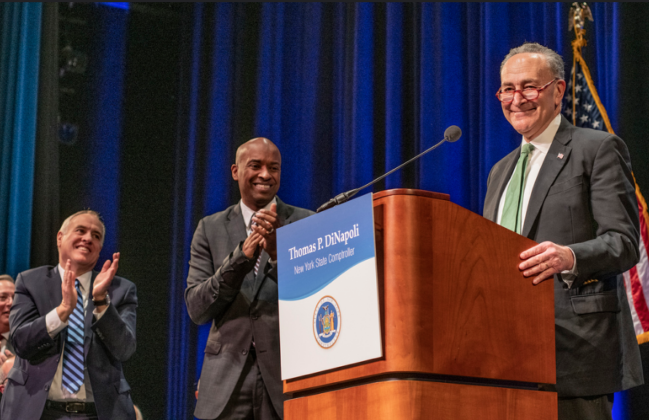 Senator Chuck Schumer speaks at DiNapoli’s swearing-in ceremony. 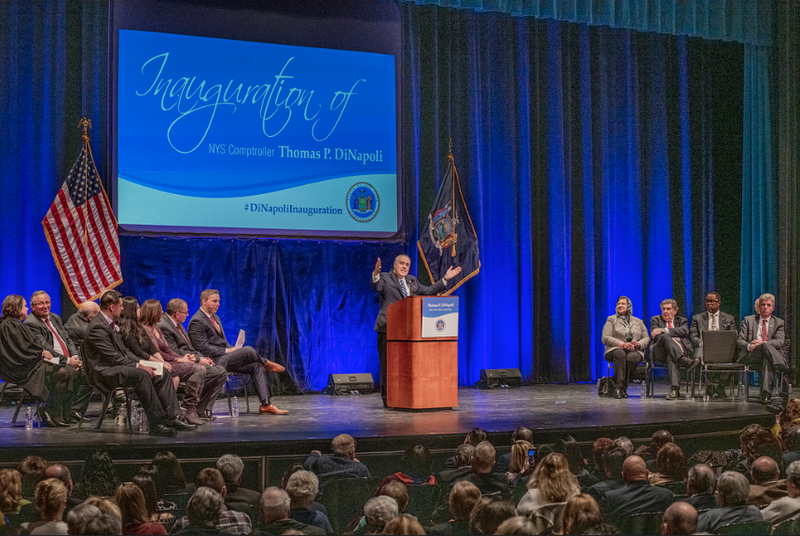 NYS Comptroller Thomas P. DiNapoli speaks at his swearning in ceremony. Thomas P. DiNapoli was sworn in to his third term as NYS comptroller by NYS Supreme Court Justice Helen Voutsinas at Hofstra University on Sunday, Jan. 13. During his inaugural address, he pledged to drive an agenda that helps everyday New Yorkers, holds government and school districts accountable, fights public corruption, protects pensions and examines big spending areas. 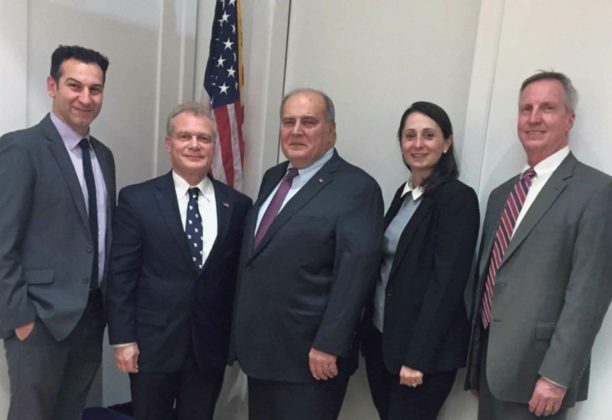 NYS Assemblyman Anthony D’Urso is sworn in for a second term. Assemblyman Anthony D’Urso took the oath for a second two-year term to serve the 16th Assembly District. 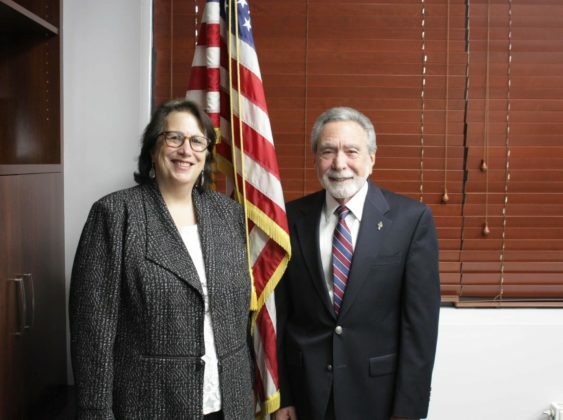 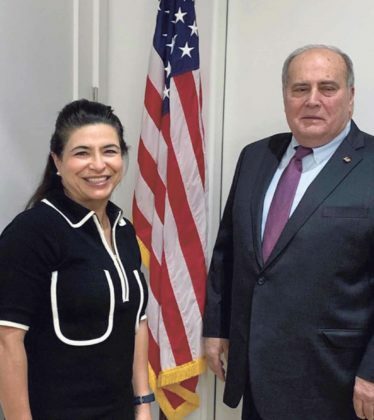 He will continue as chair of the Long Island Sound Task Force, a member of the assembly’s committees on Environmental Conservation, Veterans’ Affairs and the Asian Pacific American Task Force and will also be a member of the Education, Local Governments and Election Law committees. 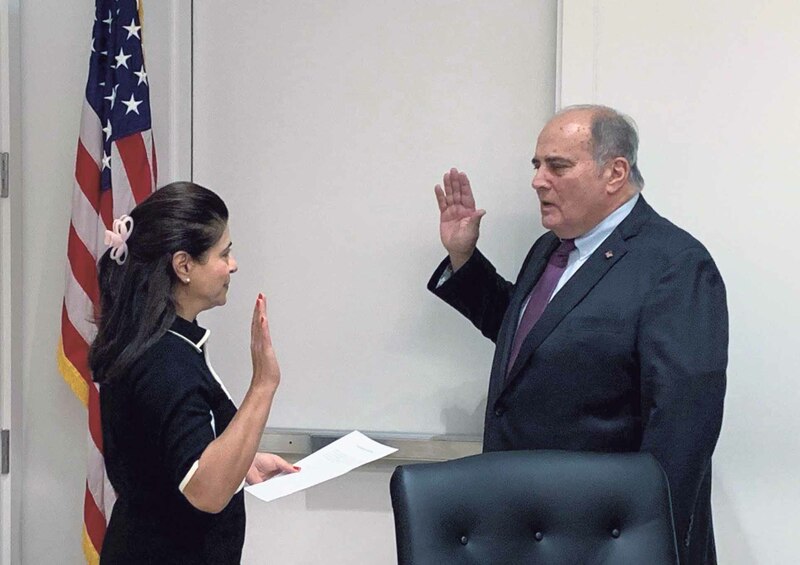 Robert A. Lincoln, Jr., is sworn in by Senator Anna Kaplan for his seventh term as commissioner of the Great Neck Park District. Robert A. Lincoln, Jr., was sworn in for his seventh term as commissioner of the Great Neck Park District by Senator Anna Kaplan on Thursday, Jan. 3. 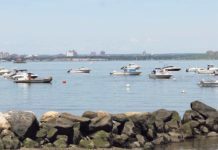 A week later, the Great Neck Park District held its first public Master Plan meeting to gather ideas for enriching the future of the district and introduced a pilot shuttle bus to the Great Neck Long Island Rail Road station for commuters. 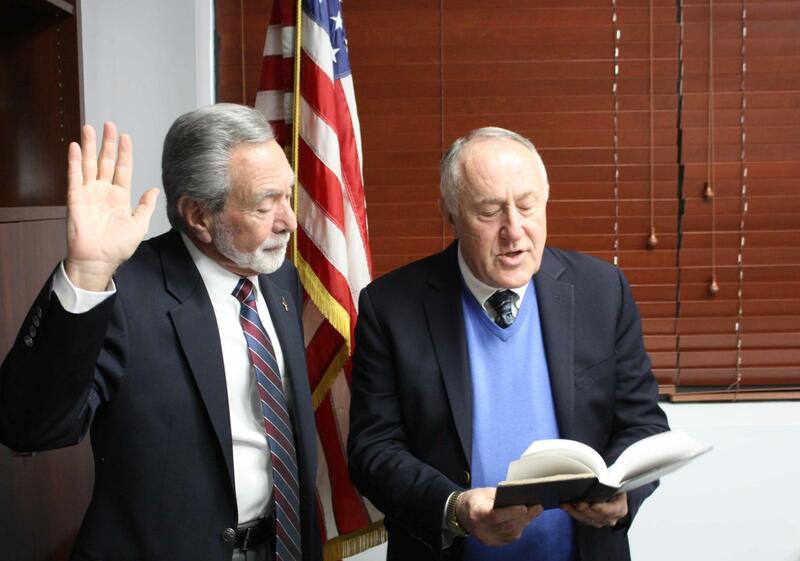 Great Neck Water Pollution Control District Commissioner Steve Reiter (left) takes the oath of office. Following his swearing in, Great Neck Water Pollution Control District Commissioner Steve Reiter (right) poses with Commissioner Patty Katz. Great Neck Water Pollution Control District Commissioner Steve Reiter was sworn in for a third term to a district regarded as a model for wastewater treatment centers in the northeast.